In a recent decision by the First Department of the New York Appellate Division, the panel upheld a trial court’s decision to grant an injured worker’s motion for summary judgment, holding a defendant owner liable for failing to meet its duties under New York’s scaffold law. The case, titled Cronin v. New York City Transit Authority, is based on a claim for compensation for the victim of a ladder fall. The plaintiff, Charles Cronin, was doing work on a ladder in a narrow space when he fell approximately three feet to the ground. The straight ladder he had been using, supplied by the New York City Transit Authority (NYCTA), lacked rubber footings. Cronin filed a lawsuit for money damages based on, among other claims, a violation of New York Labor Law § 240(1), also known as the Scaffold Law. NYCTA filed a motion for summary judgment, arguing that Cronin’s claims should be dismissed before trial for failing to state a viable claim for damages. Cronin filed his own motion, seeking partial summary judgment. 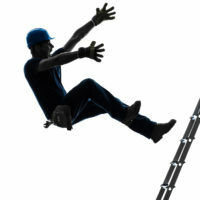 In his motion, Cronin asked the court to find that, based on the evidence already before it prior to trial, NYCTA was liable for his ladder fall injuries under Labor Law § 240(1), as it had failed to provide the necessary safety equipment to do his job as it was required to do under that law. The trial court denied NYCTA’s motion, and granted Cronin’s motion, finding NYCTA liable under § 240(1). On appeal, NYCTA argued that Cronin was the sole proximate cause of his own injuries; in other words, it was only Cronin’s own negligent acts that caused his injuries, rather than any negligence on behalf of NYCTA. NYCTA argued that Cronin should have used the A-frame ladder in his employer’s van, rather than NYCTA’s straight ladder, as he was instructed to do. Cronin responded to this argument by claiming that the space was too small to use an A-frame ladder. He also pointed out that NYCTA had not presented any evidence of anyone telling him not to use the straight ladder, or proof that he knew he shouldn’t use the ladder. In essence, § 240(1) imposes liability on employers or owners who fail to provide adequate safety equipment for work done at a height, where the absence of that safety equipment resulted in injury. Unlike some other statutes, the employer or owner remains liable even where the injured worker was negligent, unless the negligence was the only cause of the injury. For example, if a contractor unknowingly provided a defective harness to a worker and repeatedly insisted the worker wear it, but the worker refused to do so and was injured after falling from a height, then the worker’s negligence, rather than the failure of the harness, would be the sole proximate cause of his injuries. In the present case, the Appellate Division rejected NYCTA’s arguments that Cronin’s negligence was the sole cause of his injuries. The court’s opinion noted the lack of evidence that the space in which Cronin was working would have accommodated the A-frame ladder, and found no evidence to support the argument that Cronin knew not to use the straight ladder. The Appellate Division upheld the trial court’s decision. If you’ve been hurt on the job as the result of a ladder fall, defective scaffolding, or failing to receive the safety equipment you needed to avoid injury, contact the experienced, determined, and effective New York personal injury and construction accident lawyer Leandros A. Vrionedes for a consultation on your claims, in Manhattan at 212-889-9362, and in Queens at 718-777-5895.